Thursday 21:st of June, at 12:07 pm local Swedish time was the summer solstice for this year. From now on the warmest period of summer will come, while the days get shorter until December 21:st. This is also the time when many people go on summer vacation, as have I. 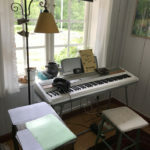 Though I’m spending time at my summer house, I enjoy the luxury of free time to do some composing – but in a more rural setting. The Summer Sale is continuing troughout August. Take the opportunity to buy unique Big Band charts at a discount for your band’s autumn startup. 20% off on all compositions, and 15% off on all arrangements. I wish all you visiting here a really nice and relaxing summer!